Today… A sudden realisation hits me. Should i be doing something while this TSW hits me? How should i ride it out.. How should i ride this eczema wave? My leg is probably not gonna heal so fast..
I’ve not worked for almost a month now… Next week im starting a part time assignment helping my relative. The money is negligible. Seriously im only agree-ing to it becos shes my relative. I dont care for part time work seriously. I dont feel like waking up and bandaging my leg to work. Its depressing to see it like that. Sigh. 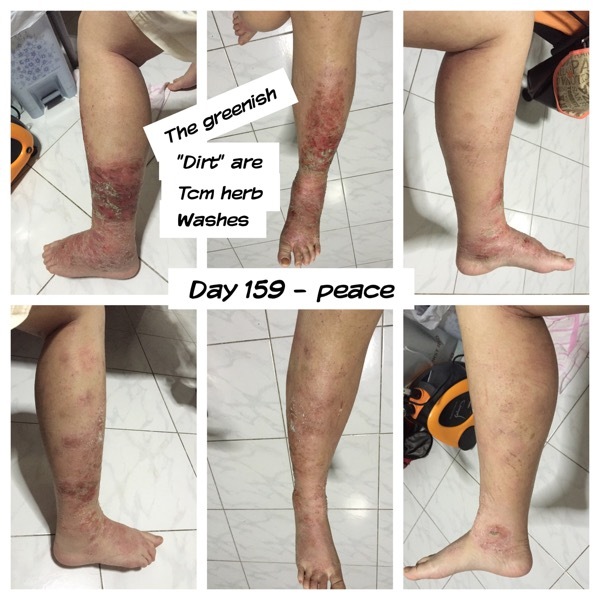 This eczema battle. WHAT TO DO? I think i’ve reach a point where im alittle bored. Im thankful for my parents though. Very thankful. Junks: chocolate tunnocks wafer, a kitkat bar(2 pieces), rice cracker..
Been googling about nutritional deficiencies tonight. And my mission for tomorrow: im gonna weigh the chicken pieces in my chicken rice tomorrow. I suspect im not eating enough protein for wound healing eating too much protein can burden the liver and kidney but too little and my wounds arent healing! But my main protein source is like my daily chicken rice. Other than that, i eat very little meat during dinner. Perhaps like afew bites of lean pork.